Finding shoes that do more than fit isn't always easy for the average guy. Most people know it. So in much the same way Aksel Paris wanted men to rethink shirts — with better style, firm collars, and a better fit — owner Yazid Aksas wanted to rethink shoes. Early last year, the company only had two product lines: shirts and espadrilles. We loved the espadrilles enough to write about them, but the newest footwear addition is even more striking. They call it the Broughton Collection. We call it cool, with some stylings reminiscent of the 1950s. Although this new line was launched last summer, it's still relatively unknown to anyone outside of the Aksel Paris converts. There are four styles of shoes. And all of them are inspired by creating a hybrid somewhere between athletic shoes, sneakers, and something more formal. The classic look is achieved with rich, deep weathered brown leather. But the real standout for most of these shoes are the lines created by stitching that lend more form to fashion. You haven't seen any shoes quite like them, at least not for a very long time. Four shoes with stories after their namesakes. James Figg. Named after the first English bare-knuckle boxing champion in the world, the Figg probably best illustrates exactly how Aksel Paris would like to change foot fashion. 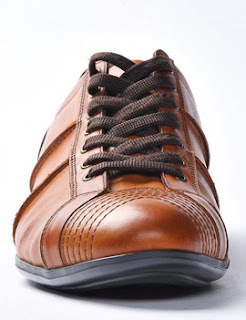 Like all of the shoes, these are 100 percent leather (except the laces and treads), with thoughtful stitching across every bend point and reinforced on the toe and heel. They are impossibly comfortable for anyone who doesn't want too much arch or heel, not unlike the boxing shoe styles of the 1920s and 1930s (except for the lack of a high top). Although some of the design features are well after Figg, the style keeps with a theme. They have a gentleman's toughness with some soccer or rugby influences. Figg, by the way, also alludes to where Aksel Paris pulled the Brougton name. Jack Broughton was one of three Figg proteges. He was the first person to ever create a set of rules for boxing. He also served as a bodyguard to the British monarch. Christopher Monck. According to stories, Monck was the very first person to organize a boxing match in 1681. It was between his butler and his butcher. The butcher won. Monck himself wasn't one to pull punches either. Although he was the Second Duke of Albemarle and Lord Lieutenant of Devon, he resigned his latter title to join James Scott in open rebellion. But unlike Scott, he survived and was later appointed to be lieutenant governor of Jamaica. The shoes were designed to bring in an aristocratic flair, much more sleek than the rugged Figg, with fewer stitch lines and a stylish toe. The vintage look is made complete with laces that thread close to the toes and a cut that is not dissimilar to bowling shoes as much as boxing. John Jackson. With a much more convincing athletic shoe look, the Jackson provides more support and reinforcement than the other designs. If you really think about it, it captures some stylings that are reminiscent of Sailing Light Adidas from the early 1970s. Of course, the construction is superior to anything made back then, and Aksel Paris keeps a high welt around the heel for added support. As for its namesake, he is best known for defeating 3-year English boxing champion Daniel Mendoza. Later, Jackson opened a boxing academy for gentlemen in London. William Futrell. The fourth shoe in the collection is the most stylish as well as the only design to add more color. It keeps the familiar flair of the Sailing Light, but then adds in beige, brown and blue. It's also the only shoe in the collection with suede leather. While I am less excited by the way the three-tone suede looks from the top, there is still a lot to like about it. The design is sleeker without the addition of any detailed stitching along the break point of the shoe, limiting it to the areas where the different colors come together. The name, Futrell, comes from the first publisher of a dedicated boxing paper. The pair I purchased was the Figg. They are extremely comfortable, fitting slightly snug at the stitch points but not at all constrictive. The construction is solid, even if they aren't meant to be athletic shoes but rather a casual shoe that blends in several styles to make something especially unique. While the Figg and Monck are casual, you can easily sneak around with them in more formal settings. The Broughton Collection By Aksel Paris Strikes 6.2 On The Liquid Hip Richter Scale. The branding behind the shoes is a bit mixed. Although Aksel Paris says they are inspired by the 1950s, the shoes skip over boxers like Tony Zale and Marcel Cerdan (who they name on their site) and drift further back in time when gloves weren't even part of the equation. Likewise, they might borrow from boxing but even in the 1950s, almost all boxing shoes were high tops. There are only a few down sides to the shoes, and neither affects everyone. Browns are the only colors available to keep the rich, classic look. And some styles have surprisingly limited sizes. The Figg, 8.5 to 11; Monck, 8.5 to 10; Jackson, 8.5 to 9.5; and Futrell, 8.5 to 11. All of them retail at a steal ($99 to $109). The link — European Men's Fashion — will take you to the Aksel Paris site. Then click on footwear.